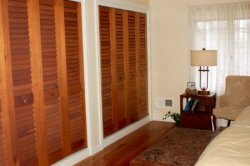 The choice between installing bifold doors and sliding closet doors depends on a few different factors. The use of the closet, the space around the closet, and, of course, your personal preference, are all considerations. 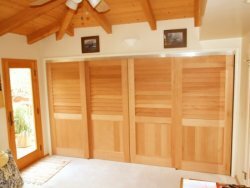 What is the difference between bifold doors and sliding closet doors? The first thing to do is to look at how these two types of doors function. Bifold doors, just as the name implies, are a pair doors that are hinged together and fold up together. This means that you can take all of the doors and fold them up to the sides so that they are out of the way and you have almost full access to your closet. With sliding closet doors the doors slide back and forth on multiple tracks and can be stacked up, one in front of the others. Since the doors never fold out of the way, fully exposing the entire area, there will always be some part of the closet blocked. What is in your closet? Will the closet be for clothes, storage of seasonal items, or used as a pantry? If you will only need to get to one part of the closet at any time then a sliding or a bifold will work well for you. If you need full access to the closet, or you just want to be able to open the doors and see everything at once, then bifold doors are your best choice. Keep in mind that sliding doors can be removed if you should need full access once in a while. What is around your closet? Is there limited space around your closet? Is there the concern that if you open up the doors they might hit furniture or artwork on your walls? Do you want a streamline fit, rather then doors folding out into the room? If this is the case then sliding closet doors are probably your best option. Which do you prefer? Another point, just as important as those mentioned above is, simply put, which do you prefer? Even if one of the door installation types is not completely ideal for you, it may still be worth it if you really like the look enough. Regardless of which track hardware you choose, you can still pick whichever style of door you like the most. Every style of door that we offer can be mounted with hardware for either bifold doors or sliding doors . These are some really nice closet doors. Our closets all have the sliding doors and I’ve really been wanting to replace those for something like these. Thanks for posting the pictures and giving me the inspiration.